Are you an SQL programmer that, like many, came to SQL after learning and writing procedural or object-oriented code? Or have switched jobs to where a different brand of SQL is being used, or maybe even been told to learn SQL yourself? If even one answer is yes, then you need this book. A "Manual of Style" for the SQL programmer, this book is a collection of heuristics and rules, tips, and tricks that will help you improve SQL programming style and proficiency, and for formatting and writing portable, readable, maintainable SQL code. 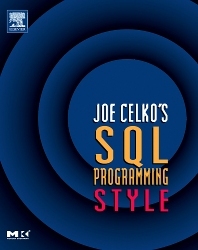 Based on many years of experience consulting in SQL shops, and gathering questions and resolving his students’ SQL style issues, Joe Celko can help you become an even better SQL programmer. Help you write Standard SQL without an accent or a dialect that is used in another programming language or a specific flavor of SQL, code that can be maintained and used by other people. Enable you to give your group a coding standard for internal use, to enable programmers to use a consistent style. Give you the mental tools to approach a new problem with SQL as your tool, rather than another programming language — one that someone else might not know! Managers seeking programming standards in their shops, team leaders seeking programming standards in their projects, SQL programmers attempting to set up programming standards in their own work, and newer SQL programmers who want to build good habits from the start. Joe Celko served 10 years on ANSI/ISO SQL Standards Committee and contributed to the SQL-89 and SQL-92 Standards. Mr. Celko is author a series of books on SQL and RDBMS for Elsevier/MKP. He is an independent consultant based in Austin, Texas. He has written over 1200 columns in the computer trade and academic press, mostly dealing with data and databases.